At the July meeting of the UK Values Alliance a session was run by Peter Johnson that took everyone through an exploratory journey into the power of creativity. 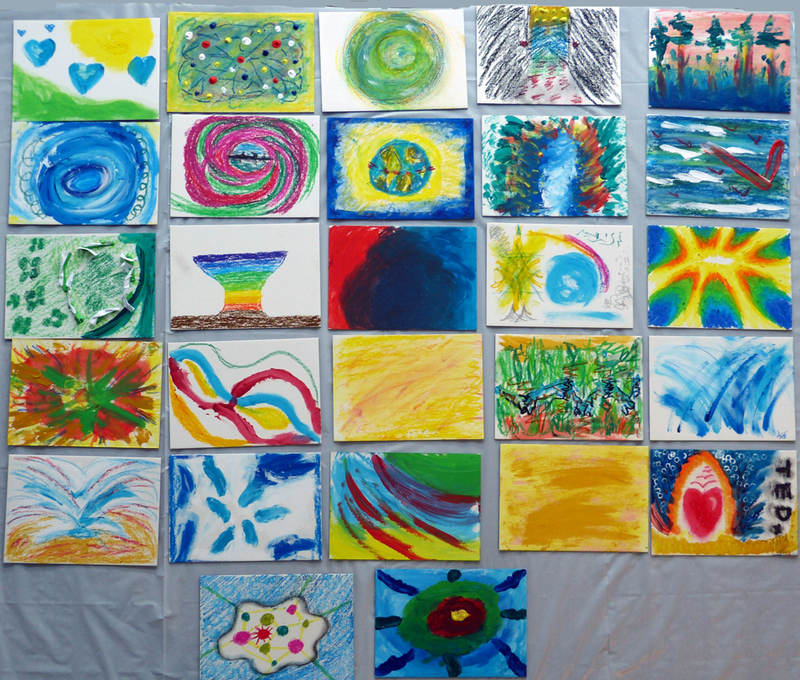 The focus was for everyone to create a unique piece of abstract artwork at the session. This was achieved by using the power of thought and suspending the school based pressure of producing a painting that looked like something, such as a vase of flowers. Each piece is a representation of the thoughts of the person at the time the piece is created, and will always be right. Part of the approach was to think about what has significance for the UK Values Alliance. Each individual work of art was then created using paint on an artist board – during the early stages of painting there was silence in the room but then the room began to get noisy with excitement as everyone completed their piece. Once the painting had stopped there was a sharing of the ideas that had been created, without judgement, and the exploration of the story that each ‘artist’ had used to produce their work of art. This was a fascinating experience, Peter has a powerful range of ways to develop individuals, teams and organisations so they can create positive, lasting change. This approach has been developed with a leading artist, Louis Parsons, and is called VisionScaping, and was certainly very insightful for the room of members. Finally all of the smaller pictures were pulled together into one large pictorial grouping – called the UK Values Alliance VisionScape Mosaic. The photograph of the mosaic that represents the collective view of what has significance for the UK Values Alliance based on individual member’s perception is as shown. The power of this approach, when correctly facilitated, is to open up ‘real conversations’. Conversations that unlock potential and can create a powerful vision and team bond in driving an organisation forward. All too frequently teams are either stuck, or are playing too small in their ideas. Having worked with an extensive number of organisations in his freelance business consulting, Peter states that the illusion that good communication abounds is one of the biggest myths. Poor communication is an area that causes most frustration, at times anger, and all too frequently inadequate results. The power of creativity in a group setting is fabulously powerful and opens up new communication and focus for any organisation – and where better to start than messing around with paint in a fun way with a serious intent. The session created a real buzz, new conversations, and it certainly got us talking and thinking about our own vision. If you would like to help in creating your own values based vision do contact Peter at peter@peterjohnsononline.com – his enthusiasm will certainly rub off.